Vintage German Drip Glaze Jug Pitcher Brown Cream Green 16.5cm. Condition is Used. Dispatched with Royal Mail 2nd Class. In very good condition. No chips or cracks. A really stunning decorative item. X4 Miniature BULGARIAN TROYAN Drip Glaze Pottery Vases / Jugs / Pots. If you would like us to hold the item (s) for a longer period. Collections Available We are not a storage facility . W Germany Large Plant Pot in good condition. says w germany numbers 810- 23. it is very heavy buyer can collect or by Dispatched with Royal Mail 2nd Class. SCHEURICH KERAMIK W. GERMANY. Brown shiny glazed pot with Sunflowers motif. PLANT POT/PLANTER 887-12. of the pot which can be seen in my photographs. 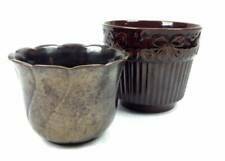 This is a lovely plant pot/planter which is in excellent little used condition. West German Scheurich Brown and Red Vase 239 - 41 West Germany. Lovely West German Scheurich Brown & Red tall vase in great condition. Original West Germany retro pottery/stoneware vase. Upper part glossy glazed dark brown, lower part matt rusty colour. Stamped 517 - 30. Good condition - used. See photos for tiny manufacturing imperfections - 2 tiny spots/bubbles visible on outside under collar and indentations on base. Slight scuff on bottom edge as shown in photo. Height 30 cms, top opening 9 cms, width at base 13 cms. Dispatched with Royal Mail 2nd class post. 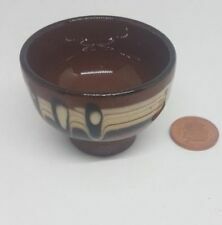 West German Pottery Planter Brown And Red Scheurich Vintage in great condition. Please look at the photos as these form part of the description. Dispatched with Royal Mail 2nd Class. Pottery dog in good vintage condition. Handpainted eyes, nose and mouth. Just one blip at base which I can't work out whether is a surface chip or a bit where the glaze didn't take when originally made. There are minor surface marks due to age. No makers mark and there are black marks on base from where it has sat on a surface. He measures 8" tall. This is a traditional handpainted Greek vase and has 'Handmade in Greece' stamped on the base. It says Kefalonia painted in Greek alphabet on one side. Suitable to use as an ashtray, nibbles dish or just looking decorative. Excellent condition with no flaws. A really nice vase decorated in brown and red. Scheurich Keramik West German y. Large brown & cream Fat lava floor vase, made in 1974 by Scheurich Keramik. Fully marked to the base W. Germany 553-38. See photos for full report. Happy to make you a cuppa while you have a look and make sure it's what you want. West German Pottery vase in the great colour with swirl pattern. It has the W German mark on the bottom with the code 887-14. The size is 16cm high at the base its 6cm in the middle its 10cm and at the top its 5cm. T20 on the bottom. Lovely condition. West German Scheurich Brown and Red Vase 239 - 41. Lovely West German Scheurich Brown & Red tall vase in great condition. Marked Scheurich W. Germany 239-41. Width of jug at widest point - 11cm [barrel of the jug]. Width of jug across top rim - 9.5cm. We have eclectic tastes. If we state an item to be from an era (i.e. "Victorian"), this will be a researched decision and we will be certain that we are correct. If we state a specific year (i.e. "1892"), that will be a certain decision. Vintage French Vallauris Studio Pottery Fat Lava Vase and 2 candle holders. Vintage French Vallauris Studio Pottery Fat Lava Vase and 2 candle holders.. ( tiny chip on one holder ). Collectable items. to be Dispatched with Royal Mail 2nd Class. Large West German Scheurich pottery floor vase. COLLECTION FROM DEWSBURY, WEST YORKSHIRE. Very good condition. LARGE VINTAGE WEST GERMAN SCHEURICH VASE 268-40 ht 40.5 cm VGC. LARGE VINTAGE WEST GERMAN SCHEURICH VASE 268-40 ht 40.5 cm very good condition. Dispatched via Hermes, or local collection. Any questions please ask. Lovely large retro vase with vibrant red stripe. Very good condition, no chips or cracks. Measurements are 41cm height and 15cm diameter. Vintage West German Scheurich Keramik Fat Lava Vase 414-16 Matt Green Brown. Dispatched with Royal Mail 2nd Class. West German Pottery vase/jug in the great colour with drip pattern. It has the W German mark on the bottom with the code 401-14. The size is 16cm high at the base its 6cm in the middle its 10cm and at the top its 5cm. Heavy Vintage Urn Shaped Vase Brown Cream Pale Blue Foreign Fat Lava? Brown cream and light blue glazed urn shaped vase. marked FOREIGN at the base. not sure of exact origin or age but not modern. 1960s Small biscuit brown & black funnel neck fat lava vase by one of the smaller West German factories,P Keramik. West German Pottery. Happy to make you a cuppa while you have a look and make sure it's what you want. Large Vintage West German Pottery Vase Scheurich 292-40 Brown Cream 1960s. Height 39cm. VGC. Dispatched via Hermes, or local collection. Any questions please ask. West German Scheurich Brown and Mustard Vase 208 - 21. Lovely West German Scheurich vase in great condition. Marked W. Germany 208 - 21. GREEK pot with figures around. Trinket pot. Interesting story depicted around the outside. For sale is this XXL West German pottery floor Vase or stick stand in a rich brown/mustard tone. VINTAGE RETRO WEST GERMAN FAT LAVA VASE - SCHEURICH KERAMIK RIBBED RED 292 - 15. Dispatched with Royal Mail 2nd Class. Mid Century West German Scheuric Vase. Brown and orange. Ombré design. Firing mark as shown in photo, not damage. Height - 42cm. I would suggest it dates from circa 1960s / 1970s. It has the numbers '484/26' marked to it's base. One little chip under the lip. Marked to base Dee Cee Foreign. Porcelain and China. Gorgeous old vase in very good used condition as seen in the photos. 42 cm tall. Small Brown Ceramic Handled Vase - Jasba 1700 08.